Celtic Knot Font - Create custom Celtic Knotwork on your computer! Introducing a revolutionary new way to create beautiful custom Celtic Knotwork on your computer! All of the Celtic knotwork on this site was created with the Celtic Knot Font. Now anyone can create Celtic Knots in minutes - just install the Celtic Knot Font on your computer and type! Each character or "letter" in this amazing font makes a piece of Celtic knotwork. You just type the pieces you want to create unique designs. It's so easy and fun! Looking for Clip-Art? This is better! We have hundreds of ready-to-use designs that are all scalable and editable so you can customize them for your needs. You'll be amazed at how easy it is to create your own patterns with the Celtic Knot Font. See examples of woodworking, polymer clay, pyrography, machine embroidery, leatherwork, CNC machining and routing, cross stitch, egg carving, scrollsawing, airbrush and decorative painting, vinyl signs, laser engraving, weaving, beadwork, stained glass, and other projects done by our customers. See how easy it is to create your own original knotwork by just typing! You don't have to be an artist or even a monk. 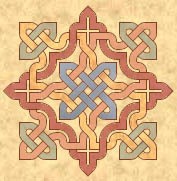 Photoshop and Paint Shop Pro tips and tricks, and other ways to enhance your knotwork. Not only is the Celtic Knot Font perfect for invitations and programs, but you can make knotwork designs for your wedding dress and cake too. Create your own personalized tattoo design, or use one of the 200 patterns we include in our Tattoo Design Set. Design your own patterns for hand or machine embroidery, or get hundreds of ready-made designs in the Pattern Packs. No extra memory requirements - only about 150 K.
This is NOT CLIP-ART! 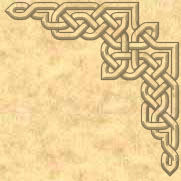 You can create THOUSANDS of different Celtic knotwork patterns and use them at ANY RESOLUTION! If you already know how to draw Celtic knots, this font will save HOURS of your time! 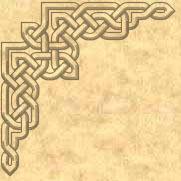 Whether you are using pencil and paper or a computer program, the font eliminates the tedious layout steps that were previously necessary to create Celtic knotwork designs. We have had great feedback from many professional artists; in fact we even sold a copy to a monk who is using it to illuminate hand crafted leather bound manuscripts at a monastery! Works on PC, MAC and Linux! A side-by-side comparison of two methods. Glorious knots! These examples have had the full range of embellishments! Check out some magnificent examples ranging from totally traditional to radical modern designs; all created with the Celtic Knot Font! Knotworkers Unite! Share your knots with other users and see knots that they have created! You can copy these knots for free and use them in your own projects. Create your own knotwork designs for needlepoint, cross stitch, hooked rugs, tapestry, intarsia knitting, blackwork, canvas embroidery and loomed beadwork with the Grid Style Celtic Knot Font. The Brick Style Font creates an offset (diagonal) grid for crafts such as Brick, Peyote or Comanche beadwork. Make backgrounds, embellishments, photo frames, borders and more. Get your Celtic Knot Font and start making some knots! You can order online or by mail. Order by electronic transfer and start using the Font today. Introducing two brand new Celtic Knot Triangle Fonts! The long-awaited Triangle Knot Fonts are finished! Each of these 2 new triangle fonts contain 60 beautiful, unique triangular knots that you can use individually or as borders and other shapes, just by typing! Many of our customers have asked if it is possible to make triangular knotwork with the Celtic Knot Font, especially the triquetra and the Trinity knot. Well, it is now - with our new Celtic Knot Triangle Fonts The two fonts include the Triquetra and the Trinity knot and ONE HUNDRED EIGHTEEN other triangular knots, both centuries-old traditional knots and many that have never been seen anywhere else ever before. The new triangle font is available in 2 styles, Outline and Filled Styles. The Filled style is designed to fit exactly inside the Outline Style. Like all of our products, these knots are drawn to a high degree of precision. Every cord is even, every line is smooth, all of them are symmetrical and uniform. No more redrawing a knot to eliminate sloppiness and imprecision. Enlarge the knotwork for your largest projects and you will see clean tight lines. Reduce it for the most demanding precision jewelry or CNC work. Each character of this font is a complete single triangular Celtic knot, ready for use in your craft or art project. Make borders, hexagons and more just by typing! From machine embroidery to wood carving, your pattern is ready. Use this new font with tools like Adobe Photoshop and Super Blade Pro to create amazing graphics. Just imagine the projects all of these knots will inspire! The tedious part is done; just add your artistry. With this new product we are also making these designs available as a vector graphics set. 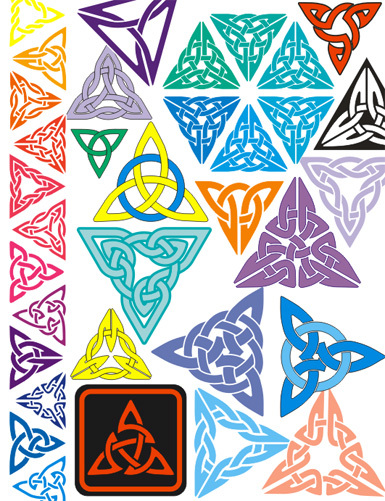 The 2 Triangle Vector Sets contains the same 60 Celtic Knotwork triangles in each set, but in formats especially for use in vector graphic programs like Adobe Illustrator, Corel Draw and for use in CNC applications. This set features all of the triangles in four popular formats: AI, EPS, CDR, WMF and DXF. These formats allow higher accuracy and fidelity than is possible with a font. Each design also includes layout lines and a continuous center line drawing for each knot. This can be used as a starting point for drawing the knotwork with variable width strokes and for 3D programs like Autocad 3D Studio Max, Rhino 3D or ArtCam. The Vector Set is designed for professional graphic artists and 3D CAD CAM work. All other knotwork on these pages was created with the regular Celtic Knot Font. The triangle fonts are not "modular" like the rest of the Celtic Knot Fonts. Each character of the new Celtic Triangle Fonts is a complete triangular celtic knot. For centuries the Celts have used these fascinating designs to decorate everything from manuscripts to pottery. The masters of this art used complex geometric diagrams to lay out these ornate mystical patterns. In recent times several artists and authors have tried to teach the art of Celtic knotwork but the process still involved complex geometry and highly developed drawing skills. Their instruction manuals have become source material for clip art with few people actually learning to make the knots because the procedure was just too tedious for the average person. But now there has been a breakthrough, a revolutionary new way to create these wonderful patterns. Anyone who can use a word processor can now create thousands of delightful different Celtic knotwork patterns. The Celtic Knot Font is a design tool that creates patterns by typing! It comes with an assortment of Celtic knot designs that you can use as-is or easily modify with a few keystrokes to make your own knotwork patterns. The Celtic Knot Font that lets you make an endless number of your own designs. 76 fully editable and resizable royalty-free knotwork designs made with the Font. (Use them as-is or modify to suit your needs.) You get borders, medallions, lines and a variety of decorative knots! A free Celtic Uncial-style lettering font. hundreds of ready-to-use, royalty-free knotwork designs (all for just $12)! You can start making Celtic knots in minutes and take years to explore the myriad designs and complexity possible with this font. Any program that has a font menu can use the Celtic Knot Font. That means that you can add Celtic knots to any document, graphic or image! For a limited time we will be offering all 4 styles in a discount package, which includes 270 ready-made royalty free designs! - click here to find out more! This is not your ordinary font. I have taken traditional Celtic Knotwork and broken it down into reusable pieces and converted each piece into a character in a font. The result is that each key on your keyboard makes a piece of a Celtic knot. available in this font for you to play with! You can assemble them into THOUSANDS OF DIFFERENT DESIGNS that are FULLY RESIZABLE. You change the size of any of the designs by just changing the font size! From 1/8 of an inch to as big as you can print, they print with SMOOTH EDGES and NO "JAGGIES" - even at billboard sizes! We have sold more than 9000 copies and NONE have been returned! We are extremely pleased to announce the release of our latest new Style! In addition to our original Outline, Filled and Inverse Styles, we now have a new 3D Style Font to add to your Celtic knotwork tool boxes. I've been working on this one for over 2 years! I have put in hundreds of hours of drawing and tweaking to perfect the realistic carved look of this new style. Each character has intricately constructed shading. As one of our Beta testers said: "It really makes the knotwork come alive!" It's as easy to use as any of the previous 3 styles, but it produces a realistic carved look WITHOUT THE USE OF ANY SPECIAL EFFECTS OR PHOTOSHOP TRICKS! The shading is created with a series of gradually thickening lines so that even at HUGE sizes it looks GREAT! It is precisely created to work with all of the other styles or it can be used alone giving a striking raised look even in simple word processor documents. The original Outline style is still the best for general purpose use, especially for crafts. If your hobby is leatherwork or quilting or wood carving (or any craft where you want to transfer the knotwork patterns to your craft media) chances are that you will want to transfer just the outline to your project. If you intend to use the Celtic Knot Font for computer graphics or print purposes consider getting the Filled style to complement the Outline style. They have been specifically engineered to work together! You can use the Outline style in one color and use the Filled style in another color. It is also usually the best choice for machine embroidery and CNC machining. The Inverse style was created to allow the creation of another historically popular type of knotwork. 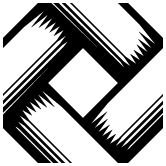 This style is characterized by a black or colored background with the knotwork bands being left the color of the paper that they are printed on. 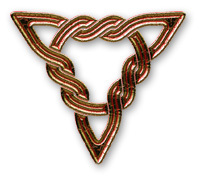 This style was used almost exclusively by Iain Bain in the classic handbook Celtic Knotwork. It is also very popular for borders on flyers and posters. The Inverse style was also designed to work with the Filled and Outline version, so you can easily fill the knotwork bands with a color other than the background, just by selecting a text color. 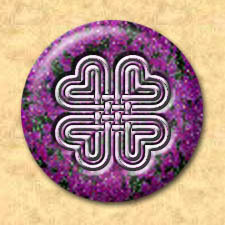 It works with the programs that you already have to create Celtic Knots. FREE Celtic lettering font included! One of the difficult aspects of the traditional methods of Knotwork design is that you almost need to know what the knots will look like before you even begin the layout. With this font there is no layout stage! You can create and experiment and let the font do the work for you. You never need to worry about which line goes over or under! That part is done for you already. Think about how much your time is worth, and think about how much time you will save using this font as your layout tool. Even knotwork experts can save hours of time even if you only use it to create few knots. If you are partial to a particular form of knotwork ornamentation, those aspects can be added to a design created with the font more easily than creating the entire design from scratch. Whether you use doubled lines, dots, zoomorphics, or other styles, you can hand draw or paint those elements into the designs once you have them worked out with the font. "This is one of the most incredible things I have ever used on the computer. I've done graphic arts for 20+ years and you did a superb job creating this!" "I am having more fun with this than any computer game!" "I love the program and feel it's one of the best twenty dollars I've ever spent." "I downloaded everything successfully, installed it and was producing wonderful knotwork on my screen, all inside of seven minutes!...The advent of sliced bread doesn't even come close. Geeze, I'm having fun...!" "Every one of the artists here that I've shown it to thinks it's incredible." "I am so happy with the program....You have already saved me numerous hours of prep work. Again, money very well spent." "I have installed the font on my PC and I think its great. It's so easy to use and being able to transfer it into 'paint' and colour in each section is terrific. Thank you very much for an excellent piece of work." "Just a big thank you for your new Celtic Font!!!! I love it." "I was very impressed with your packaging and the booklet supplied...very nice! If you ever need a testimonial to how fantastic your font is I will gladly give it. I have been using it left and right and I cannot even begin to tell you how much time it has saved me, as well as how inspiring it has been! I am constantly coming up with new projects that I want to use it with...now if you can devise a font that will give me TIME to do them all... Thank you again for your time and work, you did a great thing!" Received my fonts and wow what a trip. I have been playing with it since it arrived, and what fun." "Very simple, easy to understand, and well thought out ....Looks like you're detail oriented in your instructions for use, which isn't surprising from someone interested in Celtic knotwork!" "This is going to become one of the favorite fonts on my system!" "I'm having a lot of fun with it." "You really did a great job with this extraordinary font collection." "I've done several beadwork designs in my books with the Celtic Knot theme and this would have made my life much, much easier!" "I absolutely love playing with this, and I only started today!" "We're having so much fun with your font. We have created all kinds of really neat stuff." "I can't believe how glued I am to the computer screen, and it's not a game! My brother likes it, too, and we don't usually like the same things". "I understand several of the other members have either purchased your fonts or are planning to do so. I know that those who already have them are singing your praises. If you decide to add to your collection, please let me know as I would be very interested in adding it on." "I appreciate your program and think of it as an excellent investment." "I am endlessly impressed with how well made this font is." "That is really a good idea. I am an industrial designer and I was actually searching the web for Celtic knot examples to use as an etched detail.... Just what I was looking for." Be sure to check back often as we continually add updates to the site! NEW! see the Keyboard Layout! Click here to order or to see all our products! If you experience any problems receiving your download, please check here first. This page and all content (except where otherwise noted) Copyright © 2001 - 2015 by Daniel L. Isdell.